Many people have been writing the Honourable Mel Knight, Minister of Sustainable Resource Development, to complain about Spray Lake Sawmills’ proposed logging. The replies we’ve been receiving from Minister Knight have been remarkably similar, and contain some very contentious statements. Here are Minister Knight’s replies to James Tweedie and Gordon Petersen, and their responses back to the Minister. You may find some useful information here to help you cut through the spin. If you don’t like the answers you’re receiving from Minister Knight, be sure to write him back! Here is the letter James Tweedie received from Minister Knight, and here is James’ response. Here is the letter Gordon Petersen received from Minister Knight, and here is Gordon’s response. Here is an updated flyer (updated Aug 10, 291 KB). It can be printed and given out, or e-mailed. Please circulate it widely. 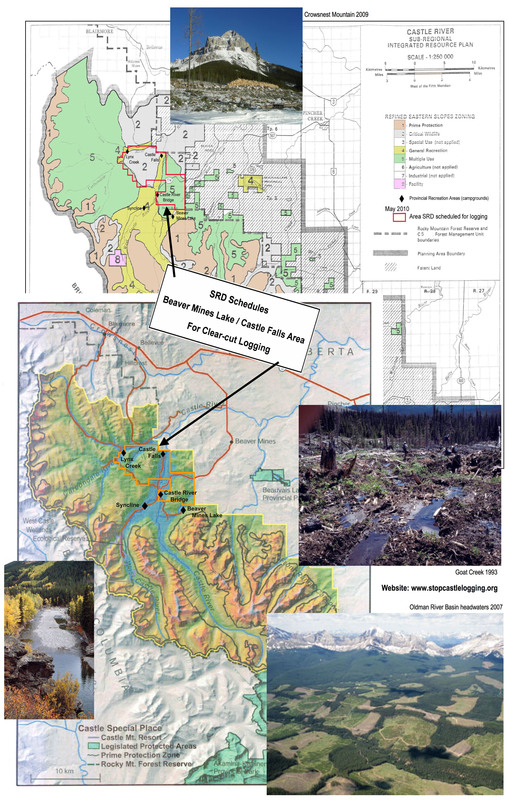 SRD did have a public advisory committee—CROWPAC (Crowsnest Forest Public Advisory Committee)—providing input into the proposed Crowsnest (C5) Forest Management Plan (FMP). But that committee’s concerns (as per letter to Minister & local papers) still have not been addressed, including about water quality, wildlife habitat and protected areas. Those outstanding concerns and public opposition to the C5 FMP lead the Minister to defer a decision on it until state of the watershed reporting and integrated watershed planning are completed by the Oldman Watershed Council. On April 11, 2006, the CROWPAC Committee sent the attached letter to the then Minister of SRD, the Honourable Dave Coutts describing some of it’s concerns. Map showing the location of the C5 Forestry Area. Here is a Poster for printing out at 11″ x 17″ (Updated Aug 10, 2.5 MB). Under the direction of Alberta’s Department of Sustainable Resource Development (SRD), Spray Lake Sawmills is preparing to clear-cut log the Beaver Mines Lake/Castle Falls area starting in the fall of 2011. Why would SRD even consider allowing this logging when 1. This is a prime recreational area, 2. The Castle Special Place is part of Alberta’s Protected Areas Network, 3. There has been no update of the Integrated Resource Plan (IRP) since 1985, 4. The C5 Management Plan has not been approved, 5. The Land Use Framework planning process (South Saskatchewan Regional Plan) is underway, 6. The Oldman Watershed Council has not completed its Integrated Watershed Management Plan, 7. [Part of] The area is under a Crown Reservation by the Parks and Protected Areas Division, and 8. There’s a broadly-supported, citizen’s initiative that’s working to have the area protected as a [Wildland] park? It would be easy to conclude that SRD is helping Spray Lakes Sawmills “get the cut out” as quickly as possible to pre-empt the planning processes that are currently underway. Once the area has been trashed, much of the planning becomes moot. Click here to see a larger version of the graphic. You are currently browsing the Stop Castle Logging blog archives for June, 2010.